What does every home need? A teapot of course and if it is my home it needs multiple teapots. Yesterday I told you our big news of our move to Alabama. There have been a few crazy weeks of house hunting and figuring things out but happily we found a wonderful little house to rent until our house in Iowa sells and I can make the full move there. We got the keys and have decked it out in what we are calling the “early beach” look with the plan that most of what we use to furnish it with will be an item we can use in that beach house we will have some day. Sounds like a great plan, right? One of the must have items was a teapot and Chris found me this adorable number at T J Maxx for a mere $12. The price was right and the teapot is adorable on our black countertop. I decided to go ahead and feature it today instead of one in my series of miniature teapots just because I can. I am still searching for a peanut teapot so if any of you find one let me know! 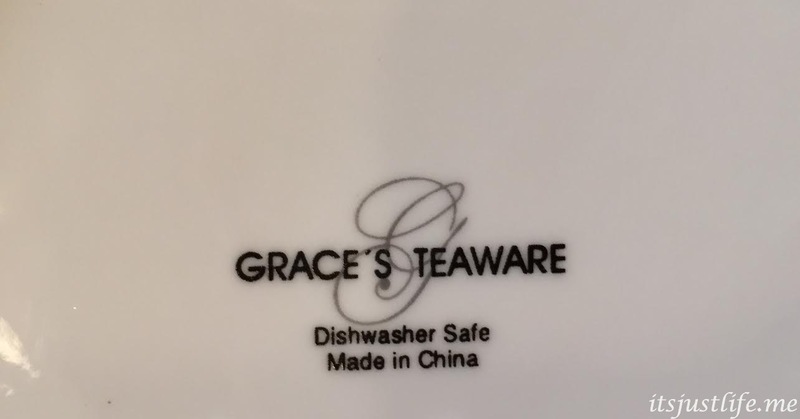 But please—enjoy today’s teapot. I know I will. For those of you who are stuck in the snow this blizzardy day why not brew up a pot of nice soothing tea to keep you warm. A perfect teapot for your beach house. I love Jerome K. Jerome and have read Three Men in a Boat (To Say Nothing of the Dog), 1889 a number of times. Always makes me laugh out loud. Great quote!! I may have to read that book since I have not read it!!! A good recommendation from you is what I needed to put it on my list. Thanks! Just bought it on my Kindle—added to the long list of to reads! Beautiful teapot! My in-laws live very close to Dothan; my husband calls L.A. (Lower Alabama) home. I like the butterflys! TJ Max always had such fun kitchen supplies and fancy foods for good prices. That is what they are especially good at—-I can spend a lot of time in their stores! You are moving closer to having your dream beach house, aren’t you? Yeah. As much as I don’t want you to leave Iowa because you are right next door to me in Minnesota, I know the warm South is where you need to be with your love. Praying the Iowa house will sell this spring and you can move to Alabama. What a lovely teapot Chris got for you. It will always remind you of his new job and move. The butterflies give her a dainty feel and yet the shimmery gold gives her some attitude! I like her! Can’t wait until we are closer to being neighbors! I know ! I know! I need to get down there so we can meet up! Often! Can’t wait! I’d love to be able to see real butterflies today… 25″ in my town (others already with 29″) of snow and climbing, winds have gusted to over 65 mph in places, travel ban in effect. But on the bright side it is the light and fluffy stuff. Brew a pot for me Beth Ann. Oh and congratulations on your upcoming move to Alabama, good luck to you both. I’ve got a pot going for you. I have been thinking about you and Beth in this horrible storm. Are you safe and sound? Yes, thank you. Beth has a touch of pneumonia and the flu, so she was pretty much housebound for the day anyway. The final tally for our town was 33.5 inches.. With some more on the way today and possibly on Monday. Ouch.. Thank you for your concern Beth Ann, I don’t think ya’ll will have to worry about snow anymore down in Alabama. Good grief. You poor thing! So far I have escaped the sickness thing but it is raging everywhere. Get well and let someone else deal with that mess of snow outside. That is nuts. Stay warm. She’s getting better now thanks to the meds the doctor put her on… I hope she’s better by Monday, more snow coming 8-14″ expected.. Yeeesh. You’re right — this one is stunning against the black counter top! Thanks, Debbie! I love it! Cute as a butterfly! 😉 I’m joining you with multiple cups of tea this morning while I look out at the pristine white landscape that is our snow-covered yard. Well, not completely pristine, there are lots of deer tracks in the back yard! Oh you got the snow. We got nada. Amazing but true. The brown grass is all I see out my window other than the occasional dirty snow pile left behind from snowplows. Crazy. Go figure! The midwest without snow in winter sounds crazy (we used to live in Kansas City). We got several inches of the pretty white stuff and snow is still flying through the air today. Ah–thanks. I think so as well. 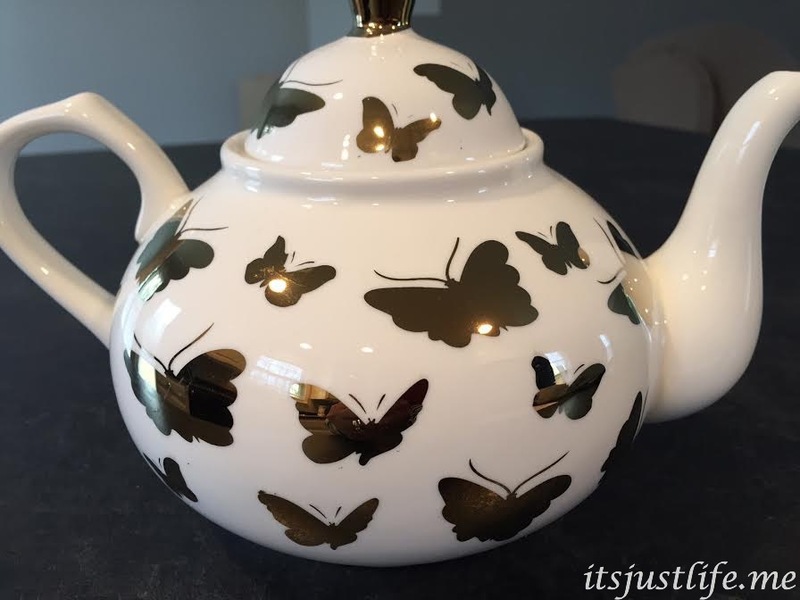 I love butterflies and I love this teapot!!! Yay! Thanks. I love it as well and especially since Chris picked it out! 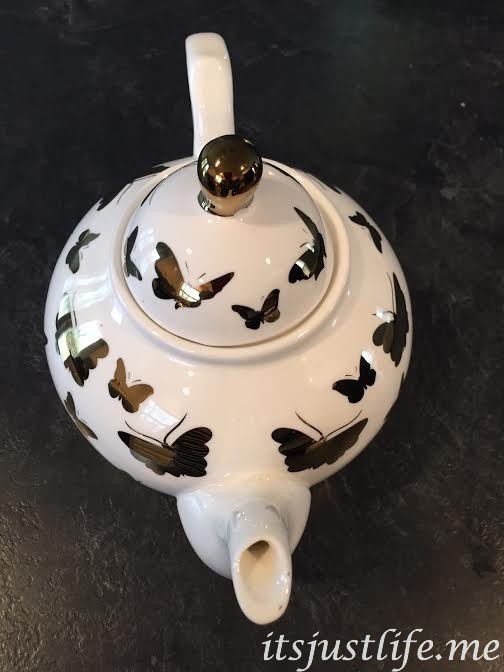 I like your butterfly teapot and it makes me think about real butterflies. I used to see a lot flying around but they seem to not be so many flying around for us to enjoy now. I think butterflies are a pretty neat thing to watch, don’t you? I love that you have a beach house dream! me too. unlikely to be realized in Canada however, but I would settle for a nice cottage on one of our beautiful lakes. 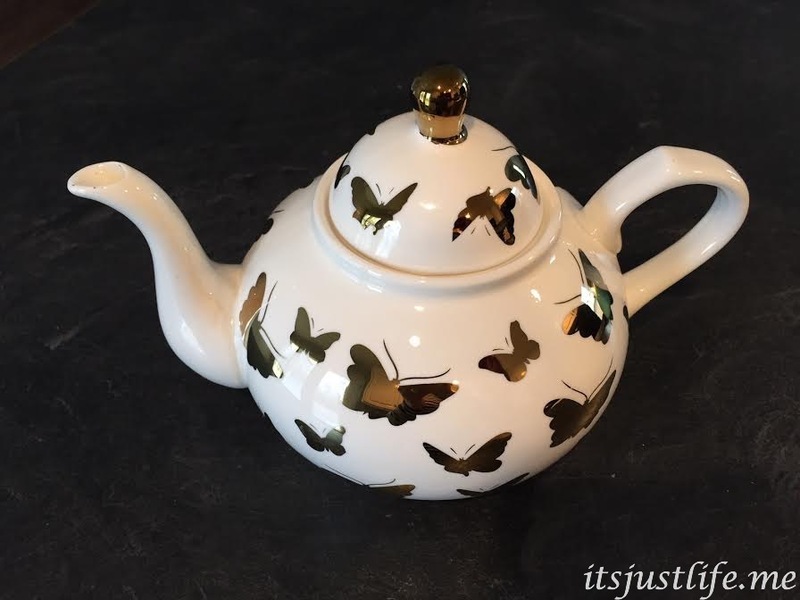 really love this pretty little teapot!